Lentil soup is my backup dinner on nights I don’t feel like cooking. I usually cook 3 pounds of lentils at a time, and then keep single serving bags in the freezer. I always make sure I have a few meals for evenings I don’t have time to cook. This dish is filling, delicious, and easy, which means it’s the perfect food to help you stay on track while dieting. Lentils are packed with soluble fiber, which means it helps you stay full for longer. Whenever I know I’m going to have a long day, I pack this for lunch. It keeps me from getting cravings or needing a snack before dinner. This nutrient dense, hearty lentil soup is a great pick me up after a hard day. Heat a large soup pot over medium heat. Add the olive oil, and saute the carrots, onion, and garlic. Once the onions have taken on some color, add the herbs, salt, pepper, and chicken broth Then bring to a low boil. Add the lentils, and stir only once. Make sure the lentils are covered by two inches of broth, add more broth (or water) so the water level is high enough. Bring the pot back up to a light boil and cover with a lid. Turn the burner down to medium low, and continue to simmer for 1 hour. The soup is done when the lentils on top are soft and tender. 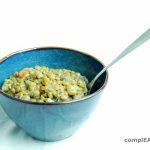 Do not stir the soup during the cooking process, the lentils will lose their texture, and become mush. Once the soup is done, serve topped with fresh herbs.